I am sorry to say the Takoyakis were not worth the long long long wait. They had the longest line and the most evil people trying to cut in! That's very normal for evil people to try and cheat their way in. After the long wait, this evil old man snuck in but I didn't let him go in front of me. They sold them by the piece for 50 cents each, which was not a bad price for the Cherry Blossom Festival. Since they do take a while to make, I took a bunch of photos to show you the process of making Takoyakis. Hope you like the cool pictures that I made into a collage. =) I was telling Ms. Lin that we should buy a ton of them and sell it to the people at the end of the line for a higher price! ^_~ Got to make a profit too! The Takoyaki was made with ground beef, green onion, red ginger, flour, eggs, fish stock, and corn starch. Ms. Lin and I both noticed that there were no Tako, octopus, in the ingredients. Boo! That negates the name TAKO-yaki! I still gave them the benefit of the doubt since it's all for fun at the festival. Why not give it a go? I was a little too greedy though. We got 2 dozen of them and they looked really nice, full of possibilities. Sadly, appearances can be deceiving. Since they were so busy, I felt that the Takoyakis were undercooked and quite chewy. They would have been a lot better if they had the chance to firm up. 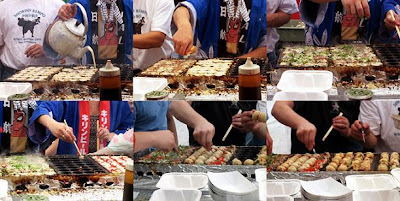 All in all it was a lot of fun, because it reminded me of the first time I had fresh Takoyakis at the festival in Mitsuwa. Even though I didn't have that great of an experience here, I will still continue to buy fresh Takoyaki to relive the great time I had in Mitsuwa! Long live Takoyakis!